The beauty writer discusses how New York's cold weather helped shape her personal style and the role beauty plays in picking out her outfits. When we hop on the phone, Rio Viera-Newton&apos;s voice is relaxed and serene — unusually so for a New Yorker. 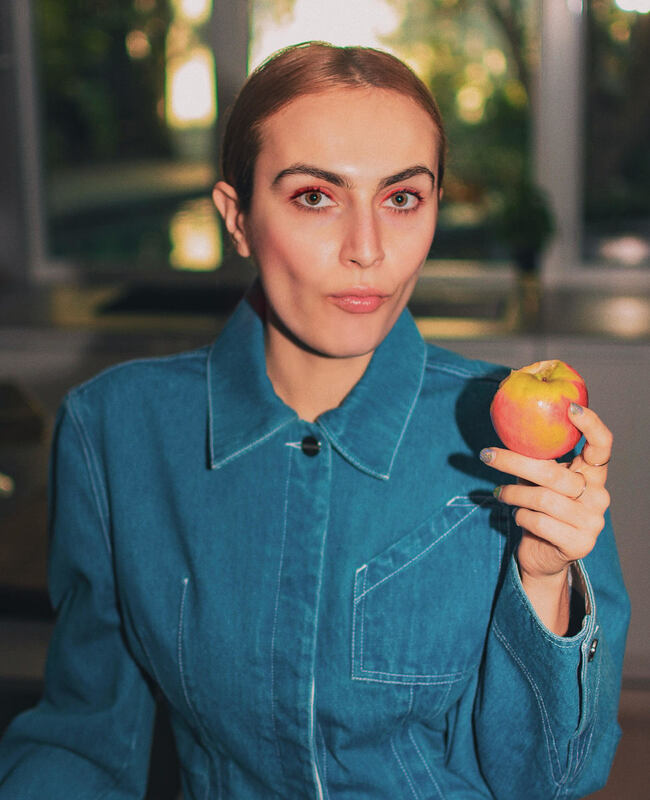 Somewhere in the midst of our conversation about where she developed her style — a hodgepodge of cozy jackets, soft pastels and collared blouses — the beauty writer and influencer mentions she grew up in Los Angeles. Suddenly, her tranquil demeanor makes sense. But while Viera-Newton says her hometown was where she began cultivating her eclectic style, New York has enabled her to really explore it. "I just feel [Los Angeles] wasn&apos;t the right environment for me to be taking fashion risks," she says. "Anytime I went out on the street, I felt like everyone was staring at me if I was wearing something that was intense or loud or crazy. And you&apos;re already a teenager, feeling incredibly insecure about everything you do, so it didn&apos;t really encourage me to take fashion risks." Living on the East Coast opened up a new realm of style freedom for Viera-Newton. "It&apos;s only when I went to New York that I felt like I could wear whatever I wanted and really had the space to experiment and explore my own kind of identity when it came to my fashion sense, because you can wear the loudest, craziest outfit in downtown New York, and no one will bat an eye." The 25-year-old — who spends much of her time writing about beauty for New York Magazine&apos;s The Strategist and mindfully curating her closet to strike the perfect balance between comfy and spritely — shares her fashion musings, including how her style intertwines with her love of makeup and what pieces have helped her brave the often not-so-friendly New York winters. "I&apos;d describe my style as playful, colorful and cozy. I really try not to stay focused on trends. I hate that word. I don&apos;t mind being the last one to wear something or continue wearing it when everyone else has discontinued. For style inspiration, Daphne from &apos;Scooby Doo&apos; is a major style and beauty inspiration of mine. Not only does she demonstrate just how amazing purple looks on redheads, she also taught me at a young age not to be afraid of contrasting colors! I love how she challenges her monochromatic look by adding a lively lime-green scarf. I&apos;d also be remiss if I didn&apos;t mention Rihanna, who&apos;s a pioneering force in experimenting with makeup and the dialogue between makeup and clothing. I think she&apos;s always pushing our expectations of how you can mix and match. I feel like I&apos;m actually a very rare case of someone that does their makeup [before putting on clothes]. The 45 minutes I spend with myself in the bathroom [in the morning] are the most important part of my entire day. It&apos;s where I process what I have to do [for the day], and where I do my skin care and makeup. I usually play with something new, maybe something I want to write about. Then I&apos;ll open up my closet and just start trying on clothes and seeing what meshes with the makeup that I&apos;ve done. I&apos;m not afraid of color, and I think that usually starts with my eye makeup. I love an accent liner, and I love planning my outfits accordingly. If I&apos;m wearing baby-blue eye shadow, I love wearing a baby-blue outfit. But I also love complimenting that [baby-blue eye shadow] with a complete contrasting look, like an all-orange outfit. I also love the way denim-on-denim pairs with any eye makeup. It&apos;s the perfect canvas. At the risk of sounding completely unhinged, another way that beauty ties into my outfits is [my hair color]. I&apos;ve been a brunette, blonde and redhead this year. When I was a brunette, yellow was my favorite color to wear because I loved the way it complemented my skin tone. When I went platinum, I&apos;d wear yellow and I&apos;d look beige all over. I looked so onetone, and it was awful. When I went red, I was frightened that I wouldn&apos;t be able to wear red anymore, but I actually like how it works as a monochromatic accessory. I also love neutral tones. Katie Jane Hughes, who&apos;s a makeup artist I love, always says that if you can find it in nature, it&apos;s a neutral tone. I love pairing a chartreuse blouse with a suede brown coat. Something that I realized is a lot of clothes I own are a coping mechanism for living in New York City: It&apos;s such a brutal city. It&apos;s cold and crowded, so wearing clothes that bring me joy when I look down — like a bright-pink coat or a cow-print bag — is important to me. I fell down the entire flight of the West Fourth Street subway steps the other day, and everyone just stepped on me. But I was wearing a really cute pair of daisy clogs, so I felt just a little bit bitter. I feel like New York is particularly nurturing for eccentrics, and I&apos;ve always been quite eccentric when it comes to my style. From a very young age, my mom encouraged me to wear whatever I wanted. She never told me something wasn&apos;t chic or tasteful or that it was too crazy. New York has also definitely upped my coat game. Let&apos;s say you&apos;re going to the office, and you just want to wear a silk blouse and a pair of jeans — that&apos;s a plain outfit. But if you throw on a really fun, exciting coat that&apos;s a bright color and a furry texture, it&apos;ll change the outfit completely. I also have a very strong relationship with the Mary Jane shoe — they&apos;re my soulmates. When I was little, I lived in London [with my family], and I used to wear Mary Janes with my school uniform, and I&apos;ve just never let them go. I love that little feminine, school-girl strap. I wear a Doc Marten Mary Jane in the winter and a Suzanne Rae Mary Jane in the summer. When I&apos;m going out to fancy events, I wear these Gucci Mary Janes. Another article of clothing I&apos;m very passionate about is denim. I&apos;ve had the same pair of Levi&apos;s 501 jeans since I was 20 — I just love them so much. Shopping for 501s can be overwhelming, and I think it&apos;s really important to try them on in person, so finding a good place that has a healthy amount of options [is key]. For New York, I love Duo in the East Village. In Los Angeles, I love Varsity, the vintage store. I love the convenience of online shopping, but I do think there&apos;s something really special about seeing [clothes] that you like, trying them on, and [finding out] they fit you like a glove. I find myself buying things online and keeping them, when, if I had tried them on in person, I probably wouldn&apos;t have bought them. [When] I shop in person, I&apos;ll go to Opening Ceremony or The Webster. I&apos;ll try on something, and then I&apos;ll sit on it. I&apos;ll probably look at about 20 times online afterward, and then I&apos;ll eventually make the purchase. It&apos;s really important for me to sit on something because I try not to impulse buy. I have a teeny, tiny closet, and it&apos;s a blessing and a curse because I feel like it really ensures that I don&apos;t make any crazy impulse buys because it physically cannot fit. I&apos;ve definitely become more interested in educating myself on the ethos behind brands. I don&apos;t really shop from Zara or Topshop or any of the places I [shopped at] when I was 16 or 17. I&apos;d much rather just wait, save up and invest in something really special from a brand that I love and believe in, rather than buying a ton of very cheap clothing from a fast fashion brand. I just feel I have a stronger connection to the clothing I wear, and I find that those pieces of clothing stay in my rotation for years after, instead of coming in and out. My sister [Harley Viera-Newton] has a clothing brand called HVN that I adore and I&apos;d be remiss not to mention, because it completely changed my relationship with sundresses, which is never something I associated with [before]. I also love Sandy Liang, Ashley Williams and Maryam Nassir [Zadeh]. Lorod is one of my favorite brands. My favorite unattainable brand is Miu Miu — I literally pass it and have heart eyes for everything they make, but I don&apos;t often indulge. But that&apos;s not to say I always wait for things to go on sale; I do try and budget myself as much as possible, but I think splurging can be important sometimes. If you&apos;re having a really bad day and you&apos;ve saved enough money, go and get that thing that you love. I think treating yourself is a very important part of the buyer&apos;s circle, but I know if I gave myself the room to treat myself too often, I would be going crazy. I do a gigantic purge once a year. I take every single thing out of my closet, and I ask myself if I&apos;ve worn it in the past six months. If I haven&apos;t, I put it in a separate pile and then at the very end of the day, I look at that pile and have a serious conversation about every single on the clothes. I say, &apos;What do I see myself wearing this with? Will I wear it again? Does it communicate my personality? Does it still make me happy?&apos; And then I&apos;ll make a decision whether to keep it accordingly." 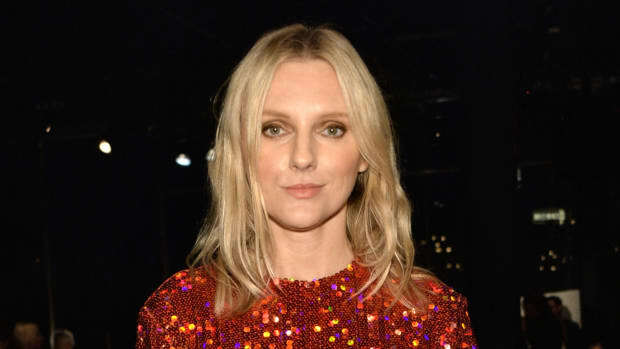 The 'Harper's Bazaar' executive editor gave us the scoop on her favorite T-shirts, jeans and high-street picks and her plans to wear Hawaiian print muumuus to Fashion Month. The 'Lucky' editor in chief discusses her high/low approach to dressing, the best way to shop a sample sale and how she plans her outfits for fashion week. Estée Lauder's global beauty contributor discusses shopping for vintage in Paris, her favorite stores in Seoul and how she shares clothes with her mom. The interior designer and all-around stylish person behind lifestyle blog 'Eyeswoon' discusses her eclectic approach to getting dressed.